1. it rained (well... drizzled) during the night and there was great excitement when we awoke in the morning. gumboots and a coat where donned for splashing in the puddles ...but sadly no puddles could be found. 2 & 3. i rummaged through a box in the shed to find the dearest little china tea set. this set belonged to my big girls when they were small. it is just the right thing for a tiny tea party with tiny teddy bears and dollhouse dolls, a tin of buttons for food and felt balls for balloons all set out upon a vintage doily made by my nanna, in the teepee. it made for hours and hours of independent play for jess this week. 4 & 5. the view from our windows is very lovely. 6. first fig of the season from our tree. 7. summer fruit waiting to be cooked and popped into the freezer. 8. ''found you!'' hide and seek is the game of the moment. 9. i realised as i was sorting through my fabric stash that it has nearly been a whole year since i have had the inclination to sew anything much (i have done bits here and there but not much). my fabric basket was testement to this as it still had the remains of the kcwc, held in april last year, thrown in and the list of items i had been trying to get through. i think i burnt myself out big time. i do find it quite pleasing to see my stash looking so neat and tidy, i don't think i will be messing it up with any sewing just yet! 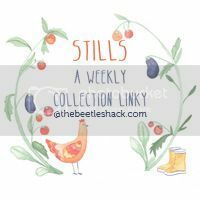 linking up with emily at the beetle shack. All that summer fruit and a neatly arranged fabric basket are lovely images to stare at. Thanks for sharing! Are you doing kcwc this year? opps! my google account no longer recognizes me!